Though you may not physically see the rats inside of your home, there are multiple signs that point to a possible rodent infestation. Scampering or scratching noises as well as droppings, urine, rub/gnaw marks, or nests, are all good indicators that you could have rat problems. During the fall and winter months, rats gnaw their way through weak access points in search of shelter and warmth. However, if your home provides adequate food and water, they will continue to live indoors where they will begin multiplying, creating an overwhelming infestation. The most common rat found in Orlando is the Roof rat. Outdoors, they nest above ground in vines, trees, and woodpiles, but enter buildings and settle inside of attics, chimneys, and walls. Females give birth to 4-6 litters per year, with an average of 6-8 young per litter. Within two months, the rats are sexually mature and can begin the gestation cycle over again. Because of the damage rats cause, homeowners are always eager to get them out, and with good reason! Most of the time, residents will go to a nearby store and pick up a quick and easy solution to solve their rodent problems. However, without addressing the root of the problem, the rats will keep getting inside no matter how many traps you set. Snap Traps – Relatively inexpensive, and will kill a rat instantly; this is the preferred trapping method. With snap traps, you get better results, and it’s also easier to locate them to dispose of the bodies. Glue Traps – These are not a good option because they need to be in a dry and dust free area to work correctly. They are also inhumane and cause the rat to suffer a slow death since they do not work immediately. 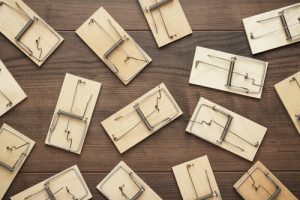 Live Traps – While many animals can be caught and relocated, it is illegal to catch and release rodents. Also, rats that are released into the wild don’t have a high chance of survival anyways. We never recommend using poison. Not only is it dangerous, but it’s also ineffective. Rats are cautious animals with new objects in their environment. They may not ever attempt to eat it, and if they do, they’ll most likely find an obscure place to die, causing a terrible odor, adding to your list of problems. If you believe you have a rat infestation, call the experts at Critter Control® of Orlando today. We utilize a 4-step process to remove the rats, which include inspecting, removing, repairing, and excluding. Call us today at 407-295-7194 for your free estimate.